If anyone else saw it and just wanted to have feelings somewhere, this is the post for it! I'm pretty positive fightinginfishnets will be making a better post that incorporates real analysis but this is just thoughts from someone who knows very little about Thor. Pretty positive feelings about it, spoilers inside! I really loved this one so much. 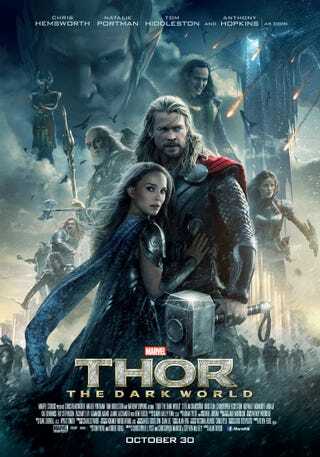 I think Thor does a great job of character work and this one was no different. I loved that Thor is clearly a more matured person than he was in the first film. I loved that Jane was all over the place and didn't die! I loved Darcy (who doesn't) and it was once again visually beautiful as hell. I do wish there was more Malekith, he was interesting but it's clear a lot of his stuff was taken out. I wanted like 150% more Sif. She's the best and I was robbed of Sif time. But I got surprise "Cap" so maybe it's a fair trade. I'm still crying about Frigga, I loved her so much! I picked up in Avengers that Loki never called her out as not his mother so this one was murder on my mother and son feels. As far as Loki goes, I'm sure plenty of die hard fans probably hated that he didn't really die. I really loved where they took his character though. I love a straight up villain that becomes redeemed but it's even better when they go back to being evil again. I think his actions as far as getting revenge for his mother and his grief was legit. But the whole stealing the throne bit just fit. I couldn't see him sacrificing himself for Thor in such a not strategic way. I hope he killed Odin though, that guy is awful. Your birthright was to die in a frozen wasteland? NOPE. Who says stuff like that to your child?! What were your feelings GT?